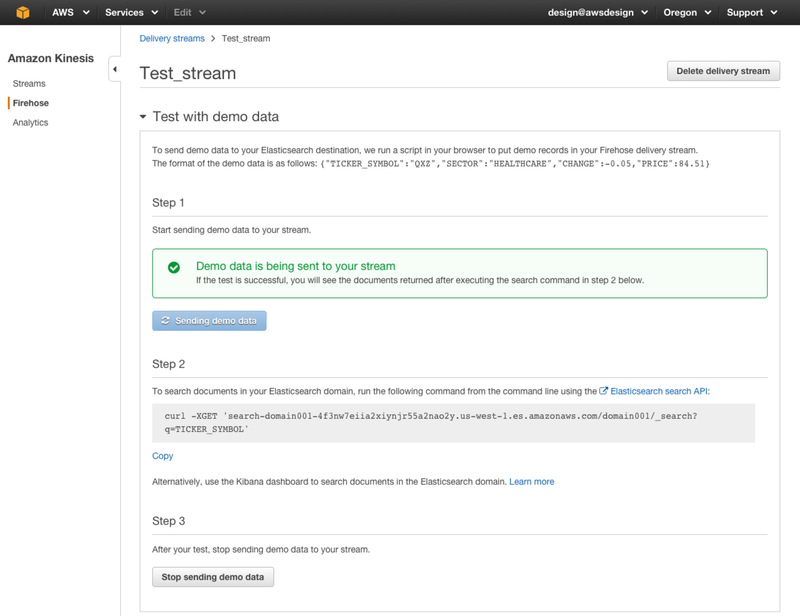 We are excited to announce the ability to test drive Amazon Kinesis Firehose from the AWS Management Console using built-in sample data. Amazon Kinesis Firehose is the easiest way to load streaming data into Amazon Kinesis Analytics, Amazon S3, Amazon Redshift, and Amazon Elasticsearch Service, enabling near real-time analytics with existing business intelligence tools and dashboards. With a click of a button in the console, you can now ingest simulated stock price data and use it to test your Firehose delivery stream configuration. The simulated stock price data is generated automatically and sent continuously to your delivery stream. This allows you to test your delivery stream setup without having to write code to generate your own test data. Standard Amazon Kinesis Firehose charges apply when your delivery stream is transmitting the sample data, but there is no charge associated with the generation of the data. You can stop the sample stream at any time from the console and stop incurring usage charges. For more information, see the Amazon Kinesis Firehose Developer Guide. To get started with Amazon Kinesis Firehose, sign into the console or try a free hands-on lab.